"Chipotle peppers in adobo sauce are the base of the marinade for this smoky pork tenderloin. The pork is grilled to perfection, and sliced into thin strips. 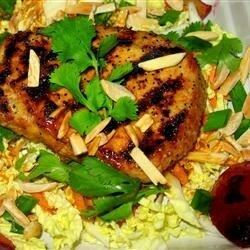 Serve on a bed of baby greens or shredded Napa cabbage." Puree first seven ingredients plus 2 Tbs. oil in a blender until smooth, about 30 seconds. Pour all but 3/4 cup of mixture into a gallon-sized zipper bag. Add meat; seal and refrigerate 30 minutes to 4 hours. Whisk 1/4 cup olive oil into remaining mixture for a dressing. Brush plums with oil; season with salt and pepper. Toast almonds in a 350-degree oven for 4 minutes. Finely shred cabbage. Set all aside. Build a fire on one side of grill, so you have direct and indirect heat. When coals are covered with white ash, place plums, cut side down, and meat over direct heat; cover and grill until meat is well seared, 5 minutes. Then turn pork to sear other side, 5 minutes more, rearranging plums to ensure even browning. Move meat and plums to indirect heat; cover and grill 12 to 13 minutes, or until meat thermometer inserted in thickest end of meat registers 145 degrees F (63 degrees C). Remove meat and plums to a platter; let sit 5 minutes or up to 1 hour. Cut pork, crosswise, into 1/2-inch-thick slices. Toss cabbage with almonds, salt, pepper and most of dressing. Arrange slaw in each of six shallow bowls. Place a portion of pork over each and 2 plum halves alongside. Drizzle with remaining dressing; garnish with cilantro. At least 10 minutes before cooking, turn all burners on high. Clean rack with a wire brush, then use tongs to wipe paper towels soaked in vegetable oil over it. Place meat on rack. Cover; cook without turning until well seared, about 7 minutes. Add plums, cut side down, and turn meat; continue to grill, covered, until other side of pork is seared, about 6 minutes. Turn off grill and let pork and plums continue to cook, covered, for 5 minutes, or until meat thermometer inserted in thickest end of meat registers 145 to 150 degrees. This was hotter than we like but very good. The meat was grilled perfectly and we liked the grilled plums....they helped cut the heat! Would leave out some of the peppers if I make it again. I used the recipe to make tacos using corn torltilla's. They were delicious! My whole family went nuts over it as we served a total of 35 tacos.